A few days ago we received information that T-Mobile would be kicking off a limited time offer for customers looking to buy an iPad and iPhone. At some point in the last 24 hours, that deal was confirmed. If you go to T-Mobile.com or go over the phone to T-Mo’s sales staff, you’ll get a $100 Prepaid Mastercard if you buy an iPhone or iPad together. Just like our sources informed us, the deal ends on September 2. To qualify, you must have both devices on an active account in good standing. Qualifying postpaid plans required; a Mobile Internet plan with a minimum of 1GB of data is required on the iPad. Devices must be purchased on the same day and receipts uploaded to www.t-mobile.com/promotions using promo code AppleBundle3Q4 within 30 days of purchase. Rebate cards may not be combined or used with any other rebate card offer, free, or other promotional offers. Reward cards will be mailed to your current T-Mobile billing address. Valid reward card requests take six to eight weeks from receipt to process. Offer expires 9/2/2014. As we’d been told, the rebate cards are sent out to customers in the mail. But be prepared to wait, as it can take up to 8 weeks for the prepaid card to reach you after you’ve submitted your rebate request. Who would waste $600+ on a i5S which will be out dated in a few months when the i6 comes out and shell out more money for a ipad just to get a $100 rebate. Way to bend someone over , once the i6 is out the i5’s price tag on them will drop like a rock just like the i4’s did. The best part about this deal is that you’re not forced to buy anything. Also, feel free to use your jump upgrade when the 6 comes out. But don’t forget , unless your in the JUMP 1 program you have to pay off half of your EIP balance on what you want to JUMP off from . Also each time you JUMP to something new , you still have to pay the full sales tax and down payment if there is one on the new items. So now that person will pay sales tax on both the i5 and ipad and then the i6 will be out in two months land they will go through the process again. No a good deal in my opinion for $100 rebate. But with the new Jump you get phones at half the full retail price basically whenever you want and as many times as you want. Only condition is you trade your old phone back in. Half the full retail price is essentially the same as a two year contract subsidy… but WHENEVER you want. But you are still going to pay the Full Retail Tax on that new phone each time you buy one . And don’t forget you have to pay 1/2 of the phone’s original retail price off when you bought it new before you can qualify to Jump . Since zero down for new phones seems to be the new norm then whenever it comes time for you to want a new phone your out of pocket is only half the cost of the original retail price of your current phone MINUS what you’ve paid towards your current device already. Still a much lower out of pocket than a contract price on a new phone and it keeps your monthly bill roughly the same. I suspect the people who say that phone will be outdated in a few months so wait for the next release are the same people who complain that the new phone only has incremental changes and is not worth upgrading. Why can’t they just take off $100 off? Why not make it $100 off of each? Heck couple of weeks ago Target had the Ipad mini for sale at it was $299,not sure which model those. Sales like these (buy two and get a discount, get $5 off $30) are there to encourage you to buy more than what you initially wanted. The store knows what the average sale is so they offer discount only if you buy extra. Just another quick sale promotion to try and move inventory, not meant for the tech savvy that get the newest devices once they release. There’s plenty of market still for older Apple devices and with their great support for older devices they aren’t quickly outdated like Android devices often see. Even the iPad 2 is going to get the ios 8 update, which I still own and use. While I think it’s a weak sale offer, especially when compared to the tablet sales T-Mobile has had earlier this year, it still might be the push some people need to buy the iPhone if they’ve been holding out or recently tried the test drive program. 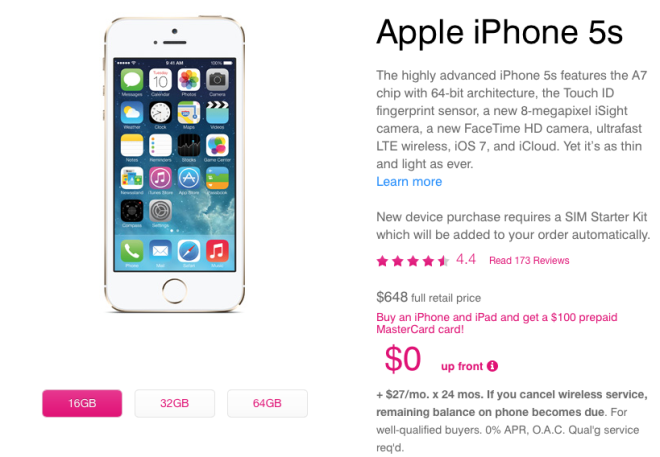 It’s not a bad deal for someone needing to get T-Mobile (or upgrade) right now. Just nothing exciting.